A sleepy Sunday morning recently at Friendicoes SECA shelter turned into an exciting surprise for all the resident dogs and cats, when 24 first-graders from St Columbus School accompanied by 30 adults dropped in for a visit. And they came bearing gifts and treats! 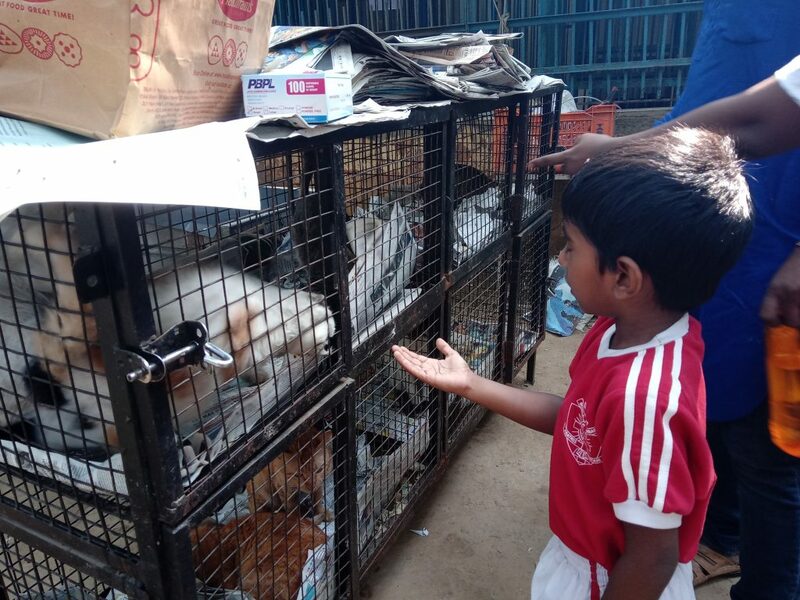 The children were full of curiosity and anticipation as they interacted with the shelter dogs. The dogs especially loved the attention. Lots of happy laughter could be heard ringing across the shelter and nonstop wagging tails ensued. For some of the children, it was their lives’ first “meet & greet” with any animal, while the other kids had no trouble making friends with the animals immediately. Some already had pets and were full of questions about the dogs living in the shelter. For our part, we hope we were able to satisfactorily answer all their queries, impart the right information and that the kids went back with a new lesson to share. We believe introducing children to animals at a young age is an important step in developing compassion in them and ensuring that they grow up to be kind adults and leaders in their communities. Sensitizing them to the pain and distress of others and teaching them to stand up for the weak and the voiceless should be an integral part of character building that every educational institution should stress upon. We are happy that St Columbus school authorities included this activity as part of the children’s awareness education, and we are grateful they chose Friendicoes for the visit. If you would like to organize a similar school visit or know someone who may wish to do so please write to ns.friendicoes@gmail.com. We would love to have you over and introduce you to all the beautiful souls in the shelter.